When you start planning a wedding the first thing you should do is set your budget, because it is budget that will determine the cost of your ceremony, wedding dress, cake, photographer’s services and cover all other expenses you will have if you want to make your wedding a really special and memorable event. So, let’s consider every item of an ordinary wedding budget so that you could estimate the amount of money you will need to organize a great wedding. Ceremony. This item of your budget will include the following: location fee, waiters and musicians’ fees, marriage license, ring pillows and stuff. Although it sounds really expensive you will spend for all these around 3% of your total wedding budget. Reception is the dearest of all other things you will have to pay for. Reception site, food, drinks, rentals, wedding cake, and favors will take about 48% of your wedding budget. Wedding attire. Dress, shoes, accessories, jewelry, headpiece or veil, lingerie and hosiery, hair and makeup, as well as a groom’s suit, footwear, bow tie, cuff links, and studs all belong here. Make sure you’ll allocate approximately 10% of your wedding budget for these. Rings. Around 3% of a wedding budget usually goes for wedding rings and engravings. Music. Good music can’t be cheap unless the musicians to play during your wedding is someone really close to you. If not, get ready to pay up to 8% of your wedding budget for music (ceremony musicians, band and/or DJ, cocktail hour musicians, sound system rental, etc.). Video & photos. This day is going to be one of the most important days in your life, so every beautiful moment should be recorded. Don’t save on it. Hire a professional photographer and videographer, buy interesting albums, additional prints, and disposable cameras for candids. It will cost you around 12% of your budget but it is worth it. Flowers. Flowers are essential at a wedding. The more the better. Ensure that you have included the cost of flowers for ceremony, bride’s bouquet, maid-of-honor and bridesmaid bouquets, boutonnieres, flower-girl basket, etc. 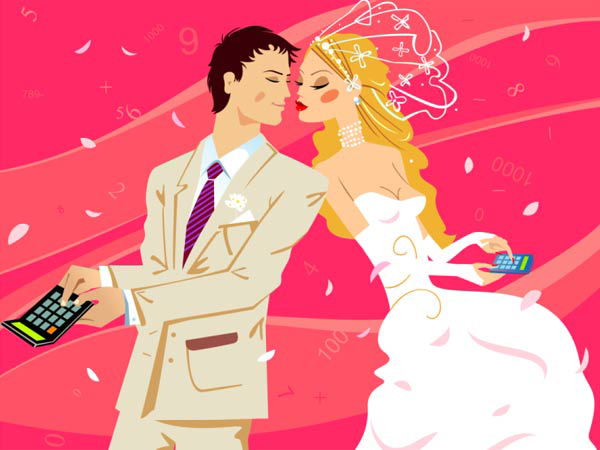 Allocate 8% of your wedding budget for it. Transportation. Transport for bride and groom, parents and guests are not for free either. Plan around 2% of your wedding budget for it. Stationery (which includes invitations, save-the-dates, response cards, thank you notes, postage, guest book, etc) and gifts to bridesmaid, groomsmen, parents as well as welcome baskets for out-of-town guests will cost you around 6%. As you can see organizing a wedding is not cheap. Every little detail costs money. However, you can always have a wedding on a reasonable budget. Or, in case you don’t want to deprive yourself of everything that wedding ceremony and reception offers, start putting away finances as soon as you decided to get married. The more you can save the chicer your wedding will be.